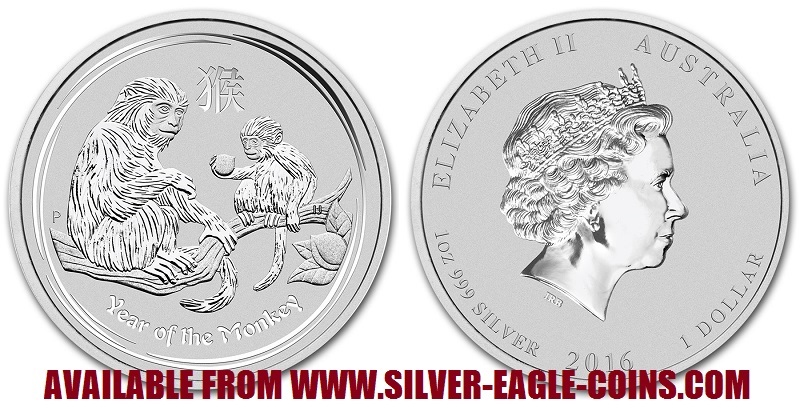 The 2016 "Year of the Monkey" Silver Dollar was the ninth coin issued in the popular Australian Silver Lunar Series II. The original twelve Australian Silver Lunar coins (1999-2010) had extremely low mintages (84,000 coins average per year) and are now very valuable and difficult to find. The Lunar Series II coins began in 2008 and differed from the original coins with a larger diameter (45 mm vs. 40.6 mm) and updated animal designs. Each coin is gem brilliant uncirculated with a gorgeous "reverse-proof" finish. The background is frosted while the images have a brilliant mirror finish. Each coin comes in a clear plastic capsule to protect the beautiful finish and contains one ounce 0.999 fine silver. The 2016 "Year of the Monkey" Silver Dollar's entire mintage of 300,000 coins SOLD OUT at the Perth Mint in the first few days of issue! As such, they are very difficult to find and prices continue to go up on the secondary market. Our supply of coins is extremely limited and may sell out without notice.